They are my band members, and good clients. We recorded vocals, Tamberine, congas, And claps, and shouts. Overall it was a fun session. We had the manager of our band sing parts too. 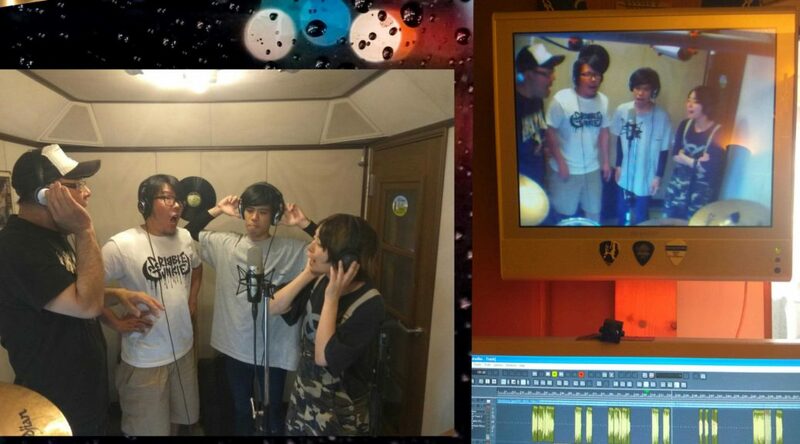 He`s on the very left in the recording booth shots. We recorded for about half a day. Took two breaks. They bought me a monster energy drink for compensation. They are a punk rock band, that had their drums, bass and guitars tracked in a commercial studio in Tokyo. We are recording vocals at this studio, because it would take too long and the budget for the band would go way beyond their budget. So they came out here with their main leader by car and that`s all I have to say for now. Previous PostA Yui Session.Next PostEditing for Dj Ali, and mixing & mastering a new Chris Ekral/commander/Larke tune.